At Balmer Limited we understand the issues facing individuals and owner-managed businesses and offer a full range of services allowing you the time and freedom to concentrate on the core of your business. We are on hand with clear, easy to understand, practical advice and support. The phone has just stopped ringing. You just missed that call. Who was on the other end of the line? A cold caller? A friend? A member of your team calling to let you know they are stuck in traffic? Or was it a potential lead that could have placed a large order with your company? The difficulty these days is that we have increasing numbers of tasks and responsibilities that seem to get in our way of picking up that handset. Missing a phone call once is one thing, missing several is another matter entirely. What is the common solution if you fall into the latter? Recruitment? Employ a new member of the team such as an office assistant or manager to help support you with administrative tasks so that you can complete other business responsibilities. However, there is another solution that could be just as, if not more, effective and efficient for your business… the virtual office assistant. What does a virtual office assistant do? What are the benefits of using a virtual office assistant? The costs per member of staff employed will differ depending on what region of the UK you are in, what entry level and position you are recruiting for and also the skills required for you organisation. The costs of a virtual assistant will also fluctuate dependant on the businesses that offer this service. It is clear, however, that there are significant benefits to using a virtual assistant one of which being the financial savings. Coupling that with the flexibility and lower operational requirements mentioned above, it supports the rise in these positions being used across a variety of sectors in the current business landscape. Could you claim up to £662 Marriage Allowance? Marriage allowance allows you to transfer up to £1,150 of your personal allowance to your married or civil partner, possibly saving up to £230 per year (Couples living together will not qualify). The non tax payer can transfer 10% of their Personal Allowance to the tax payer. This gives the tax payer a tax credit of £230 in the current year. If you have not previously claimed the Marriage Allowance you could claim up to £662. (£230 in 2017/18, £220 in 2016/17 and £212 in 2015/16). If you claimed Marriage Tax Allowance in a previous year this will automatically be applied in the current year and you only need to inform HMRC if your circumstances change. In a few circumstances you may lose out by transferring your unused Personal Allowance. If you transfer your Marriage Allowance you must transfer the full 10% this could mean as a couple you are worse off. This will happen if your income is more than 90% of the Personal Allowance and your partner’s income is less than 110% of the Personal Allowance. RTI – relaxation for micro-employers will end on 5 April 2016. After this date, they will be required to report all payments on or before each and every pay day. Capital Allowances – the limit for 100% relief for equipment will be reduced from £500k to £200k per annum in 2016. Corporation Tax – from April 2015 the rate was set at 20% for all companies, this will reduce to 19% in April 2017 and 18% in April 2020. Farmers’ Averaging Relief – in line with previous announcements, the averaging period for self-employed farmers is being extended from 2 to 5 years from April 2016. Farmers will have the option of using either averaging period. National Insurance Contributions (NICs) – there is no employer’s NICs for employees under 21 years of age. Remember that the Living Wage is introduced from April 2016 (from £7.20 per hour). VAT – EU regulations prevent the government from making sanitary products zero-rated. Therefore for the life of this parliament or until EU law permits zero-rating of these items, a fund of £15m per year to support women’s charities is being created (the sum equivalent to the annual VAT raised on sanitary products). A higher rate of Stamp Duty Land Tax (SDLT) will be applied to purchases of additional residential properties above £40,000 in value e.g. second homes and buy to let properties. The rate will be 3% above the current SDLT rate. This will not apply when buying houseboats, caravans or mobile homes, or to companies / funds making large investments in residential property. Dividend Income – from April 2016 the dividend tax credit will be replaced by an allowance in line with announcements made during the summer statement – further details can be found here. Inheritance Tax – the nil rate band is frozen at £325,000 until 2021 but has been extended to £500,000 from April 2017 for family homes. There is also exemption for pension funds transferred on death before age 75. Property Income – from April 2016, Rent-a-room relief will be increased to £7,500 pa and a new system of governing wear & tear allowances will commence. Company Car Tax Diesel Supplement – from April 2016, the 3% differential between diesel and petrol was to be abolished but this will now be retained until April 2021 when new EU-wide testing procedures will be in place to ensure air quality standards when driving under ‘real world’ conditions. 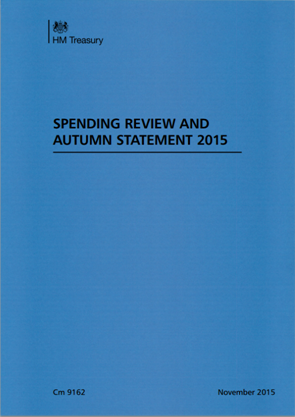 This is a selective summary of the announcements made by The Chancellor during his Autumn Statement 2015; details of the complete statement can be found here along with a pdf of the Autumn Statement 2015 itself. If you have any queries about your personal or business tax following these announcements, please contact Mike or Lynn for a free, confidential consultation on 01280 818776 or by email at info@balmeraccountancy.co.uk.